This is a collection of six essays by prominent thinkers, edited by Raimond Gaita1, philosopher and author. The extensive Introduction and the final essay are by Gaita; the other contributors are Geoffrey Brahm Levey, Waleed Aly, Shakira Hussein, Graeme Davison and Ghassan Hage. Each contributor gives a different voice to the issues, yet all come to compatible conclusions. All are critical of the way the questions around the subject have been handled – by politicians, the media and commentators of varying political persuasions. USA President George W Bush was one of many people who after the atrocities of 11th September 2001 declared that the world had changed dramatically and for ever. That it did (if it did) was largely the result of the changes in rhetoric and in thinking. One of the changes that is apparent is the different way that Muslims were thought about and talked about in Australia and, from reports in the media and on the Internet, in North America and Europe. It is this change in thought and speech that is the consistent element in the essays in this book. The six essayists approach the subject in the title from different perspectives and using different styles in their approaches, yet there is much overlap in what they say. It allows the reader to see the issues as if through different facets of the same crystal. Geoffrey Brahm Levey2 opens with an essay titled ‘Multiculturalism and Terror’. He is a teacher of political theory and is involved in writing about Jews in society. Like most of the other contributors, he addresses the myths surrounding the notions of multiculturalism and terror and shows why they are myths. The central argument in his piece is that “multiculturalism, as we know it, is a way of integrating a culturally diverse population based on shared liberal democratic values”. He goes on to argue that if there is a connection between multiculturalism and global terrorism it is a result of our failure to honour multiculturalism’s constraints and their underlying liberal democratic values. He expands his examination of the issues from the tenet that democratic liberalism recognises the rights of the individual rather than those of the group and that, therefore, no individual should be labelled in relation to any group she or he may belong to or be seen or imagined to belong to. In ‘Monoculturalism, Muslims and Myth Making’, Waleed Aly3 shows how the media and others distort events and even fabricate them in order to create antipathy – even hostility – towards Muslims in the UK and Australia. He quotes many made-up and misreported articles and those using misleading headlines designed to shock. “This kind of fictional news story should be the rarest of exceptions. But it is not and, where Muslims are concerned, it is becoming something of an emerging genre.” He looks at all this in relation to the creation of ‘folk devils’ and the ‘mythical us’. “[T]hese fictional stories exist because a particular conspiratorial world view … demands they do.” Aly argues that ‘we’ go along with the myth-making because it suits us, as individuals and as a society. In her essay, ‘On Being Muslim and Australian: Reflections from the Badshahi Mosque’, Shakira Hussein4 takes a more personal approach than the other contributors. She starts at the Mosque, in Lahore, with a young Pakistani man, Ibrahim. He wants her to feel that the Mosque is hers – that she belongs. She concludes with a similar, though imagined, gesture in front of the Sydney Opera House, offering it to Ibrahim as a symbol of his belonging, should he come to Australia. In between these bookends she examines some of what is wrong in Pakistani society, including the treatment of women, and some of what is right. She dispels myths we in Australia have about Muslim societies such as that in Pakistan. She examines the reasons many Pakistanis believe she would not be safe living in Australia. She writes that “as communicators [in Australia] become more and more preoccupied with ‘the Muslim problem’, Muslims of all class, ethnic and sectarian backgrounds found themselves ascribed a common identity, and a common stigma.” This common identity ascribed to Muslims, inside and outside Australia, by Australian commentators and media is discussed in most of the other essays as well – our inability or unwillingness to see them as individuals and treat them as such. Much of Hussein’s essay deals with the ‘Lebanese rapes’ in Sydney and how this effected relations between Muslims and non-Muslims and how these events were treated within Muslim groups in Australia, a treatment that may surprise some readers. Graeme Davison’s5 essay, ‘Testing Times: Citizenship and National Values’, looks at the issues surrounding multiculturalism from a different angle. He argues that there is a growing “appeal for the reinvigoration of ‘national values’ ” and a growing nationalism with a call “to reinforce the allegiance of citizens and newcomers to national traditions”. Much of the pressure for this has come as a response to growing numbers of refugees, while growing globalisation is also a factor in the sense of loss of national pride felt by many people in the UK and the rest of Europe and in Australia. Davison questions whether it is possible to define what it means to be British or Australian and he looks at the struggles in both countries over the methods to be employed to ensure that immigrants understand ‘Australian values’ or ‘British values’. He questions the role of citizenship tests and values statements, saying they are “a symptom of an unresolved tension in our political culture”. Most of the essay is a discussion and examination of these points. Ghassan Hage6 titles his essay ‘Multiculturalism and the Ungovernable Muslim’. “Ungovernability is not an essential quality of the object to be governed. It is a quality that emerges when something escapes the relation between a government apparatus and what it is aiming to govern.” Hage argues that Muslims did not supplant Asians in Australia as the “core threatening other” until the turn of the century. One factor that sets Muslims apart from other ethnic immigrants is that for many of them “all aspects of [their] everyday life [is] ruled by the laws of [their] God”, which can lead to a negation of the law of the land as governing aspects of one’s life. The atrocities of 11th September 2001 and the later Bali, Madrid and London bombings placed Muslims in many people’s minds as being ‘other’ to the West and its aspirations and ideals. Hage further argues that there is a problem when a group is assimilated into a host society and then feels ostracised from that society, as with the London bombers. As such, it is the same tension that prompts other marginalised people to react, sometimes violently. As with some of the other essayists, Hage looks at the events leading up to the ‘Cronulla riots’ and their aftermath. He finishes his essay with an examination of the Muslim minority in Australia, arguing that there is an intense reaction to a fear of Muslims, coming from a sense of insecurity which “is rooted in the way the press of globalisation has rendered fragile people’s structural integration into their nation states”. Raimond Gaiter1 concludes the collection with ‘Multiculturalism, Love of Country and Responses to Terrorism”. He examines “some of the ideas that inform the belief that successful multiculturalism must undermine an attachment to nation that goes deeper than dutiful citizenship … [that] deserves to be called love of country.” He dismisses the call for recognition of Sharia Law and argues that at times of external threat, loyalty to Australia must override all other loyalties. There is a need for immigrants to understand “in their bones” what it is that makes Australian society what it is and that sets it aside from many others. While the terrorist actions that have been perpetrated by Muslims in the past decade can explain the fear of Muslims felt by many people, Gaita argues that “we in Australia have reason to fear only the murderous ambitions of a handful of radical Muslims driven by a religion based totalitarian politics.” Much of his argument relies on a view of moral human behaviour having pre-eminence over most other considerations, while “morality and politics are … in a deep way answerable to one another”. As a seven-year-old migrant from the Netherlands in 1955, I experienced first-hand the suspicion many people have of ‘other’. I dressed differently, spoke no English to start with, ate different food and did not understand the behaviour of the Australian children at school. Although I cannot remember it clearly, I was probably bewildered. I do remember my at first urgent attempts to fit in and then giving up with an attitude of ‘I’ll be how I am and I don’t care what you think.’ As I grew older I observed the same tensions in other migrants and children from a range of mainly European countries. Though a migrant myself, I sometimes felt suspicious of the behaviour of other migrants because they seemed so different. Reading this book has prompted me to look at these phenomena in a new way and has taken me closer to developing answers for myself both as a migrant and as an Australian. This is a very satisfying collection of essays on a topic that causes many people anxieties and fears and engages political parties, the media, social commentators and community leaders in continual and passionate debate. 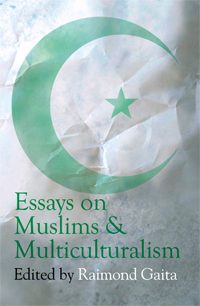 The satisfaction comes in part from the many angles from which the contributors view the overall issues and in part because the six essays help the reader to ponder how his or her attitudes to migrants and refugees generally and Muslims in particular are born and shaped, especially by others. There is rich material for discussion and I can see a valuable place for this book in secondary school curricula. It should also be compulsory reading by all our politicians, many of whom so readily fan the glowing embers of suspicion into flames of hatred. Emeritus Professor of Moral Philosophy at King’s College London, and Professorial Fellow at Melbourne Law School and the Faculty of Arts at University of Melbourne. Romulus, My Father (Text, 1988), A Common Humanity (Routledge, 2000), The Philosopher’s Dog (Text, 2002), Why the War was Wrong (ed., Text, 2003) and Good and Evil: an Absolute Conception (Routledge, 2004, 2nd ed.). Teaches political theory at the University of New South Wales, Sydney, where he was founding Director of the Program in Jewish Studies. Jews and Australian Politics (co-ed with Philip Mendes, Sussex Academic Press, 2004), Political Theory and Australian Multiculturalism (ed., Berghahn Books, 2008) and Secularism, Religion and Multicultural Citizenship (co-ed. with Tariq Modood, Cambridge University Press, 2008). Is undertaking a McKenzie postdoctoral fellowship on Muslim women, gender violence and racism at the National Centre for Excellence in Islamic Studies, University of Melbourne. She is a regular media contributor. Sir John Monash Distinguished Professor in the Department of History at Monash University. The Rise and Fall of Marvellous Melbourne (Melbourne University Press, 2004), The Unforgiving Minute: how Australia learned to tell the time (Oxford University Press, 1993), The Oxford Companion of Australian History (co-ed. with John Hirst & Stuart Macintyre, Oxford University Press, 1998), The Use and Abuse of Australian History (Allen & Unwin, 2000) and Car Wars: how the car won our hearts and conquered our cities (Allen & Unwin, 2004). Future Generation Professor of Anthropology and Social Theory at the University of Melbourne. Home/World: space, community and marginality in Sydney’s west (contrib., Pluto Press, 1997), White Nation: fantasies of white supremacy in a multicultural society (Pluto Press, 1998), Arab Australians Today: citizenship and belonging (ed., Deakin University, 2002), Against Paranoid Nationalism (Pluto Press, 2003) and Waiting (ed., Melbourne University Press, 2009).